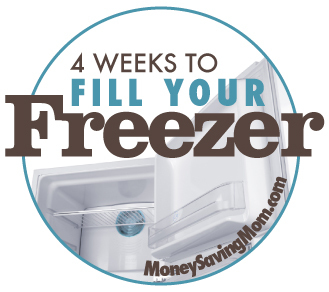 Are you ready for another week of filling your freezer? This week, we’re tackling lunches. Never would have thought to freeze pb&J. I like that idea!! Enjoy your freezing week! Do you allocate a certain amount of room in your freezer for meals and the rest for stock up items? We stocked up too heavily on frozen veggies and cheese and just don’t have the room for many freezer meals right now. Can you use some of the veggies and cheese in freezer meals in order to free up some room? I usually try to incorporate what I already have in my freezer into meals in order to free up some extra space. I can to an extent. We ran out of frozen veggies and were paying 1.00 a bag so when they were on sale for .74 I went overboard (and the cheese was just .99 for 8 oz so we bought a ton of it). I could make corn broccoli casserole. I made 30 chicken-broccoli-cheese calzones/pizza pockets this morning. Thank you! So excited for the pizza pockets! Great lunch idea! Could you reheat the southwest rollups in the microwave? Just thinking of my husband at work. These would all be great things to give him some more variety for lunch. Yes, you should be able to heat up all of the lunch items (well, except the PB&J!) in the microwave. If you stick them frozen into the lunch sack/bag, they should be thawed enough by lunch time to quickly heat up in the microwave. I have to say that peanut butter & jelly are staples at my house – as well as Nutella. My kids find a way to have a Nutella sandwich at some point every day – it works for breakfast, lunch, dinner or a snack. My kids ask for a chocolate sandwich…we eat a lot of Nutella. I do have a question – do you have a good recipe for mexican rice? My daughter LOVES rice and beans. I can do the beans, but can’t seem to come close on the rice. Thanks so much – I will be trying this rice this week! I’m making the baked oatmeal and cinnamon rolls from last week. I really want to try those recipes. I’ve found that I like to make more than one recipe if I’m going to be in the kitchen anyway. Tomorrow will be perfect to do the two from last week and the PB&J. I’m definitely going to do the pizza pocket, but I think I’m going to do it twice, once as a pizza & once with BBQ chicken ingredients. My daughter is dairy free, so I’m going to skip the ham & cheese, because I’m not sure that it would be super tasty without the cheese. I like the BBQ chicken idea! Sounds yummy. I may have to try that too! I kind of wish I could do this challenge, but I don’t have the extra in the food envelope. But these are great ideas! I’m going to try and set back some out of our monthly food budgets to do this in August, just before my husband (he teaches) starts up his classes again. If you can’t make these recipes, you might see if there are some things you can make for the freezer with what you have on hand or what’s on a great sale at your store. I’m excited to try some of these recipes! I’ve been wanting to put food in the freezer and needed some inspiration. And I was wanting some single serve items that are as easy as convenience food. Thanks for all your work! I procrastinate on freezer food sometimes, because I don’t want to take the time to choose recipes, go over recipes, figure out what I have on hand for the recipes and what I need for the recipes….. aargghh! lazy, I know!! If you want to freeze the southwest roll ups to eat individually do you bake them first and then freeze them? Or just heat them up out of the freezer? I just threw some together because I remembered I had leftover salsa chicken in the fridge. Since the ingredients are already cooked, I’m just planning on having dh nuke them at work. I have been making homemade “hot pockets” for years and my family loves them, however, I hate making the individual servings. Now I make mine “stromboli style” by rolling the filling up cinnamon roll style and bake whole for dinners and it is so much faster and everyone likes them just as much. Hope this helps. Thank you for these wonderful recipes and ideas. I modified the breakfast items for freezer a bit but these lunch items I will try them all! School for us is out in a couple weeks so I am getting ready for when the kids and I are at home together! Go freezer cooking!!!!!!!!!!!!!! Excited about the hot pockets. There are times when I just need a ham and cheese hot pocket. Thank you so much for this series. I am looking forward to trying the burritos and the pizza pockets! I’ll have to try just a couple PB&J’s too, because I am so curious how they will turn out. Definitely don’t feel like you need to do everything on this list! I’m guessing it will cost me about $60 in grocery money to pay for what I need to buy (we’ll see if that’s accurate after my grocery shopping trip tomorrow!) and I have this money set aside already. However, I know many people are opting to make just a few of the recipes or substituting the recipes with their own recipes — or just skipping these posts altogether. Do what works for your family — and your budget! I came across your blog through Pinterest! Thank you so much, I am so excited to try your recipes (especially the pockets)!!! I have a question regarding freezing…a friend gave me an amazing recipe for granola bars. We’re moving in a couple of months & I’d like to make some of your recipes, & her granola bars to stock up the freezer for our last month here. How do I know if the granola bars will freeze well? Granola bars will typically freeze well. You could try a small batch and freeze it for a few days and then thaw & eat to make sure you like how it tastes, just to be sure, though. We have a peanut allergy and use nutella. Has anyone had success freezing nutella sandwiches? I make a similar recipe as the brown bag burritos, but I guess it would be more for lunch. I make several of these in a dish and pour the remaining sauce and some cheese over the top (like enchiladas). Then you can freeze and use for dinner at a later time. These are really nice if you want to make up a pan for supper and then just double the batch to freeze for later. I just wanted to let you know I LOVE this series! I made the freezer friendly banana bread (added peanut butter and chocolate chips) and the first 2 loaves never made it anywhere near the freezer… I had to make 2 more! I tried the Black bean brownies and they were awesome! I can’t wait to try the pizza pockets! Oh and the whole wheat bread! Crystal, has anyone ever told you, that you my dear, ROCK? because you do! actually I added peanut butter chips for the first batch, then I made 2 tablespoons of PB2 and added it in to the second along with the peanut butter chips. My son loved it! Actually, microwaving the PBJ is delish as a warm snack. Just like the expensive ” crustables” in the freezer section at the grocery store. I, too, love this series and actually hit the garage sale circuit this weekend and picked up a breadmaker on the cheap! I have never made them before, but I tried the Cinnamon Rolls you posted last week. Quick question though, I baked them right away (once I rolled and cut), but they didn’t seem to rise. Should I have let them rise again? I am new to baking breads, etc. so want to ensure that I am doing it right! 🙂 Yes, I agree the whole wheat bread tastes awesome too! Yes, if you’re not going to stick them in the freezer, you’ll want to let them rise for at least 30 minutes before baking. Thank you for the response! They still were yummy, but thin…maybe I was saving calories 🙂 I will remake today with the resting period and freeze those for company this weekend. Thank you again! That is so funny, because the same thing happened to me. I found a breadmaking brand new in the box, never been used for $5 at a garage sale last weekend!!! 🙂 I haven’t used it yet, but that’s what I plan to do this weekend. I have never made anything as far as baking from scratch, (I’m a use the box kind and add to it kinda girl). I am sooooo excited to see how much I can learn! I am so loving this series. It has helped me stay organized. I think I remember you posting a recipe for refried beans on here awhile back. I miss refried beans since I don’t buy them in the cans anymore so I can’t wait to try and make my own. My tacos just aren’t the same without a goop of refried beans on them. Alright, I read this posting and got some inspiration. I had to take my child out of town for medical care. The news was not so great. I left Saturday and came home Sunday with 4 tired kiddos. I am a single parent so I was really tired. I managed to get grocery shopping done early Saturday am but that was all. Sunday evening it was I could do to get us to bed at a decent hour. Never mind my usual routine of getting lunches and dinners organized for the week which includes making 25 sandwiches, 25 baggies of carrots and grapes, 25 baggies of rice cakes, making 25 cups of pudding or gelatin and making some kind of treat PLUS planning 5 dinners. Tonight when I came home, I was too tired to do much either. I have learned if I do not stay on top of things then my routine falls apart and I lose my rhythm quickly and I get tempted to spend money. I read this posting, printed the recipes and list out, checked my pantry, made a grocery list, and made plans for a grocery trip with my leftover budget money. I continued to be inspired and made all my lunch supplies (25 sandwiches, etc), cut up lettuce, my 4 quarts of strawberries, washed grapes for lunches, washed carrots, and even made my freezer peanut and jelly sandwiches. I put a pot of chili in the crockpot for dinner tomorrow and made garlic chips (from tortillas) to go with the chili and lettuce is cut up for salad. I finally finish putting my whole strawberries out to dry and plan on making chocolate covered strawberries for lunches this week. Kiddos love them. Thanks for the inspiration for a tired mom. I now am organized and prepared for the week as well as for freezer cooking after I shop. I also will get to bed at a decent hour so I can walk 4 miles in the am. Love these ideas…and who knew PB&J could be frozen? Why didn’t I think of that? I def. am going to have to do some of these lunch ideas. Summer is when I struggle to come up with creative food ideas, esp. for lunch and it seems we are always in a rush. This would be a god-send! I’ve heard people say that it seems silly to them to freeze PB&J sandwiches when they only take a minute to make, but I totally disagree! First of all, I get up at 5:30 with my husband to pack his lunch. Any extra minute I can save that early in the morning is a big deal to me! Also, we sometimes have a hard time using up a whole loaf of bread before it gets stale, since it’s just the two of us. That’s when I usually make these sandwiches. Whatever bread is left gets converted into a great lunch/snack on the go! Saves time and money – doesn’t get much better than that! Just a suggestion, if you don’t feel like making tortillas or do not have them on hand, they are on sale BOGO at Publix until Wednesday or Thursday depending on when your ad starts and there is a $1/2 coupon in the 4/22 SS which makes the packages $1.69 for 2 10-count packages (at least thats the price at my store)! And Crystal, you are truely amazing and provide so much motivation for this lazy girl!! Crystal, I am SO thankful you are doing this series! We are expecting our first baby August 1, and I know it will be tough for my husband to have me out of commission for a few weeks! I will start this series in June because I am teaching up until May 23, but in June I am going to try to restock my freezer before the baby comes. It’s so comforting knowing that my husband will be fed and able to grab his lunches and go. It’s also nice to know that if I’m home alone with the baby and don’t feel up to cooking, I won’t go hungry either! 😉 Of course, going from two incomes to one will be an adjustment, but your blog helps out with that too. I just wanted to thank you for being such a blessing to our family during this exciting (but a little scary) time in our lives! I haven’t taken part in this challenge yet, but I plan to work on it over the summer, when I’m off from school. Since I’ve found your site, I’ve been so much more productive. I set goals and then reach them! Thank you!!! My house is cleaner, life is calmer, and I feel much more successful. My goal this summer is to really work on my cooking… I’m not great in this area, but I’m encouraged to try! I really want to try my hand at making bread, pizza dough, etc… Thanks for a great website… You really do have the heart of a teacher! The Brown Bag burrito recipe sounds great, although we make a really quick and simple burrito by just mixing warmed refried beans with a little salsa and topping with cheese, then wrapping in a tortilla. I make a huge batch of these really fast by using my Pampered chef cookie scoop! Love the plan for this week & am so excited to get started. I also like only cooking 1 day all meals if possible, I did last week and they came out excellent! Ty so much! So this week I actually HAVE to split it into 2 days because I intend on making my own refried beans and tortillas! So tonight I’m soaking my beans and TM ill make both of these so there ready and also going to make your baked oatmeal (had to wait to pick up ingredients). Thursday is going to be my massive cooking day where I finish the rest of ur awesome recipes as well as my sons coconut cupcakes with white chocolate frosting to bring to his school Friday which is his Birthday! I might’ve gone a little overboard this week lol but we will see how it all turns out! Thank you so much for such great recipes and inspiration, so glad you have this! I would love to do the pizza and ham&cheese pockets (can’t do PB because of allergies), but is anyone planning to pack these for lunches that go to school? If my kids were home, I’d heat the sandwiches up, but I’m not sure how I’ll package them for travel. Can we package the burritos like the Southwest Roll-up’s…skipping the foil and the paper towels? Crystal do you use your bread machine for the pizza and ham pockets? I think I’m going to try it to speed up the prep time. I have made the ham and cheese pockets using the bread machine but not with the recipe you listed. I was just wondering if this recipe would work in the bread machine. I think I tried it once and when I opened up the machine, the dough was super gooey. So I wondered if you had different results. They were really good though with the other recipe I used as well. Thanks for all the tips on freezer lunches! What’s the best way to freeze the pizza pockets? I just finished cooking them! I’d let them cool completely and then stick them in airtight ziptop freezer bags. Way to go on getting them done already! I love the freezer ideas… But I have a suggestion. On the frozen burritos, instead of using tin foil and such, why not wrap them in freezer paper, this way, you can just take it out of the freezer and pop it into the microwave. Just a suggestion! That would definitely work — especially if you’re not planning to cook them in the oven. Anyone know how freezer paper compares to foil when it comes to price? I don’t think I’ve ever purchased freezer paper before so I haven’t a clue! I don’t think that there is that much of a difference in price. Plus if you weigh it out, you would still be saving money (Not to mention you would still be saving a few precious seconds, that we as moms do not have many of!). Considering that purchasing a pkg of 10 burritos is 6.97, and the freezer paper is probably around 3-4 dollars. Let me know if you get up to the store before I do!